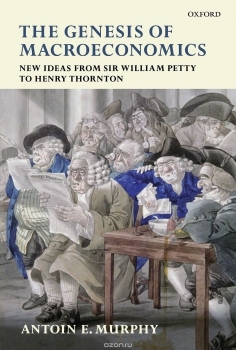 Описание This is a book about the discovery of the great macroeconomic concepts and ideas by a group of very exciting people between the late seventeenth and early nineteenth century. The writers concerned included the anatomist Sir William Petty. John Law a convicted Scottish murderer who became Prime Minister of France. Richard Cantillon, a multi-millionaire banker apparently murdered in London in 1734. the Scottish philosopher, David Hume. the French writer, Francois Quesnay, personal physician to the King s mistress, Madame de Pompadour. the former seminarian and future Prime Minister of France, Anne Robert Jacques Turgot. the author of the Wealth of Nations, Adam Smith. and Henry Thornton, who, along with William Wilberforce, was instrumental in having Parliament legislate against the slave trade. The book shows how these economic writers discovered many of the key concepts of macroeconomic theory long before the term macroeconomics gained currency in the 1930s.